These canned tomatoes are so good with hot mashed potatoes or plov. This recipe yields six 1/2 gallon jars of canned tomatoes. 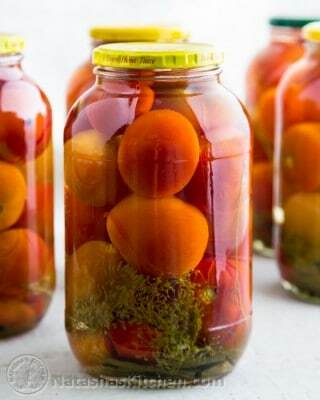 You can easily cut everything in half and make just 3 jars if you don't have a ridiculous amount of tomatoes. Store at room temp or cooler for up to a year. Preheat oven to 215˚F. Wash all of your jars and lids with soap and warm water. Place jars in the oven on the bottom rack for 20 minutes or until completely dry. Boil lids to sterilize them. In a large pot, boil 6 1/3 quarts of water. Add: 6 Tbsp salt, 6 Tbsp sugar, 1 1/2 cup vinegar return to a boil until salt and sugar are dissolved. Divide your sliced bell pepper, peppercorns, dill, bay and horseradish leaves (if using), among six 1/2 gallon jars. Add tomatoes and pack them in as tightly as you can without squishing them. Pour boiling hot syrup over your tomatoes. Screw the lids on enough to keep the seal in place but don't over-tighten them since air bubbles need to be able to escape and place in the oven at 350˚F for 15 min. Carefully remove from oven (don't tighten the lid more or you might disturb the seal that has formed), flip upside down and let cool to room temperature.